The house I grew up in was an American Foursquare built around 1908. It was white stucco and siding, with a shady front porch and a graceful elm tree out front. The basement was scary, at least when I was younger, what with the old 'octopus' furnace. As teenagers, the basement became our rec room, a place to play music and dance around, play darts. But the attic was our playroom. Half the attic was used for storage and Dad's train set. The other half was ours. We stapled posters to the slanted ceiling and walls. The carpeting was a hodgepodge of remnants in different colors and styles. It was cold in the winter and hot in the summer, but it was a wonderland to us. As we grew older, toys were boxed. Dress up clothes were donated to charity (or tossed in the case of a few gowns that were tattered). And then the old house was sold almost a decade ago and those boxes were unpacked in a new playroom at my parents' new house, entertaining the next generation. But the kids are getting older and no longer play with some of our old 'friends'. This weekend it was time to cull some of the collection. And so Mom, Tracy and I took a walk down memory lane. The old play stove, still standing after all these years. The old play stove, handmade from plywood, an old faucet, and some paint, is still standing, solid as ever. Yes, it shows wear and tear, but it's simple design, with painted on burners, was all we ever needed. It'll go in my sister's garage sale this spring, along with our many toy pots and pans, plastic food, and other play kitchen wonders. It used to sit in the corner by the front windows in the attic playroom, the table and chairs nearby. We each had our own dollhouse. The houses were identical, but we chose the shelf paper for the walls and floors, thus customizing them. Many a trip was taken to the local shop, which we walked to on our own, to buy new furniture and such for our dollhouses. Mine didn't survive the move, but the boys still play with this one. They are very creative, choosing to put the kitchen on the second floor, for example. The house will hopefully stand a few more years until they outgrow it. Some of our old games. Just as when we were growing up, there is a closet full of games. Many of the boxes are taped together and some pieces are surely missing, but we spent house playing those games. I've brought a few home, adding them to our game shelves, but the rest still live in their closet, waiting for the boys to be ready for them. There are a few they can play now, like Hungry Hungry Hippos, and some we need to introduce them to, like Can't Stop. That was always one of my favorites. My babies, well-loved, not a retirement fund. 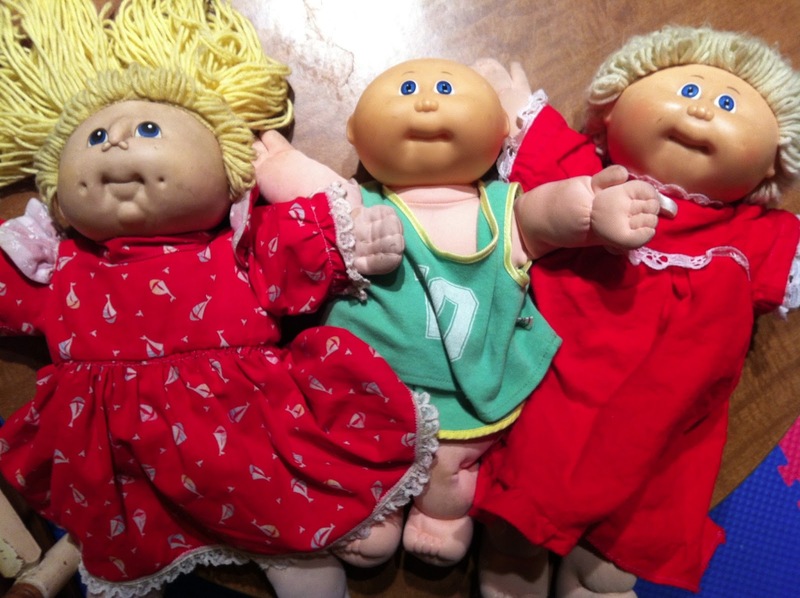 Yes, I was the perfect age in 1982 when Cabbage Patch Kids burst onto the scene. My first doll, the one with long hair, is not a 'real' Cabbage Patch doll, but I loved her just as much as the others that followed. My Cabbage Patch Kids had quite a wardrobe, with 'real' clothes and handmade ones from craft fairs and ones my mom made. Their diapers are long gone, but they and their clothes are ready to be loved by a little boy or girl. Need a seat? Let me give you a hand. Do you remember the Green Giant? His face (or hand) graced many items in my childhood. We had foot sleeping bags and patterned sleeping bags. And we had this chair. Its molded plastic is just the right size for small bottoms. And it's staying right where it is, ready for little sprouts to sit cozy. White picket fence not included. Did every child of the 70s and 80s have one of these Fisher Price houses? With the odd little people and the single seat car? Two of these currently live in the playroom at my parents' house. One was ours and one lived at my grandparents' house in the basement playroom. These compact little houses are a classic. Many an hour was spent on the domestic affairs of the little family in the perfect blue house. Strawberry Shortcake and friends, before they were teens. Strawberry Shortcake is making a resurgence. But I had the original dolls. Orange Blossom has sadly been lost to the rough play of rambunctious little boys, but Strawberry Shortcake, Lemon Meringue, Blueberry Muffin, Raspberry Tart, Lime Chiffon, Butter Cookie, Cherry Cuddler, and Apple Dumplin', along with their pets, the Berry Bake Shoppe, Snail Cart (with Escargot), and Flitter-Bit the Butterfly, still come out to play with the boys. Their hair no longer smells yummy, but they were well-loved. It's a bug, bug, bug, bug world. I admit, I liked bugs. Most don't bother me and many are very cool. Maybe Bug World House was a ploy to stop me from waving worms in my sister's face, but I loved it. It was one of the coolest toys. Wil and Sam have both loved to play with it too. It has an eggshell shower, a potato balcony, a peapod hammock, and cute bug friends. What could be better? Creative play at its best: Puzzle Town! And then there's Puzzle Town. This is a set that will not be leaving the family anytime soon. As soon as I pulled a few pieces out to take a picture, the whole family gathered in the playroom to build the buildings. Richard Scarry was a genius. And marketing a version of his world that kids could build and play with, changing every time, was the best idea ever. We didn't have all the sets, but enough to make a working village from farm to shops to house to city hall. I wish Playskool still made these. There were so many toys and so many memories. Some toys mean too much to get rid of, but others need to be loved again. That's the lesson of Toy Story: toys should be played with. While it's a little sad parting with pieces of my childhood, the baby dolls and Barbie dolls, the tiny plastic plates and tea cups, the costume jewelry and all the rest that we culled will hopefully find good homes and bring happy memories to another generation. Are you interested in selling the bug world? Sorry, that's one we're holding on to.